Keep warm and comfy from head to toe in footed pyjamas. Non-skid soles add a bit of practicality to these whimsical, super-soft footed pajamas with zebra hood with faux fur mane and tail. 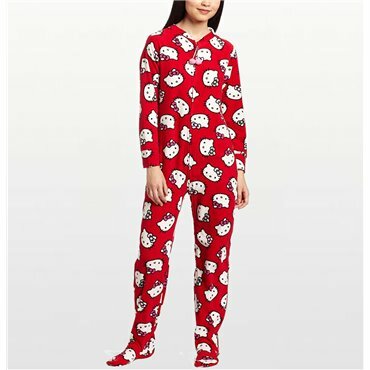 These red Onesie pyjamas feature allover Hello Kitty faces throughout the design. The material is comfortable, soft polar fleece. These footed pyjamas are perfect for keeping warm and snug on cold winter nights.